That's a question I often ask as I homeschool our two teenaged sons. Are we exercising our freedom responsibly? Reflecting upon that question and inspired by bestselling author, blogger, and homeschool mom Ann Voskamp, I decided in the 16 weeks leading up to Easter, we would tackle memorizing the entire book of Philippians. It seemed an ambitious (impossible? )—yet worthy goal. We committed to reading the entire book every day, and I planned to create a Scripture memory resource for my sons: strategically formatted flashcards. However, a problem soon arose. If you have home-schooled for any length of time, most likely you understand how even the best plans (too) often become derailed. Resources collect dust on our shelves as our lofty intentions fade into the chaos of life. But this plan was too important to abandon! I can be stubborn, and in this instance stubbornness was an asset. We had succeeded at reading Philippians every day for two months. Determined, I decided that we would memorize the book of Philippians, whatever it took! I handed each of my sons a set of newly created memory cards. With only eight weeks remaining, I knew our “by Easter” goal might be a bit grand. Consequently, although I didn’t announce this to my sons, I was prepared to extend our deadline. Yet, within three weeks, I learned something quite significant: daily efforts pay huge dividends. Because we had faithfully read the entire book every day, the verses had become etched upon my sons’ hearts. Once they had the memory cards in hand, it took them less than a month to fully memorize the entire book. By reading the book of Philippians every day, my sons could not help but memorize it (and meditate upon its message). However, the cards added the essential element—structure—to their memorization efforts. 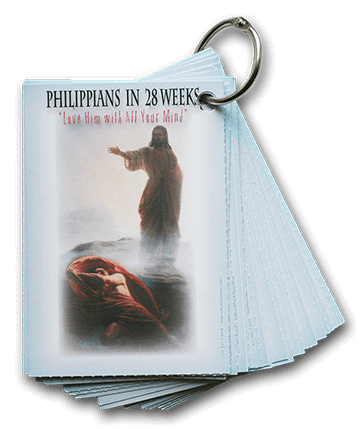 Our experience inspired to us to create Philippians in 28 Weeks (a resource which includes the memory cards, copy work, a reflection journal, and a tracking log). However, you can make your own cards for any book you wish to memorize. How you break up your verses matters. Make sure each line of text communicates a complete thought. Hole punch the cards and put them on a metal ring. This keeps them together and makes them easy to transport. Redeem the time. Look for opportunities to have your children read through the cards, like at the grocery store when you’re waiting in line, at the doctor’s office when you’re waiting in the lobby, or when you are traveling in the car. Many of us are blessed to have unfettered access to the life-giving words of the Bible. One day we will stand before our Holy God and give an account for how we managed the liberty and resources He entrusted to us. It is easier to share the Word of God when it is etched upon your heart. Let’s prepare for that day by becoming Walking Epistles!